Need Assistance? Call 1 (800) 257-1776.
if you wish to purchase. Can only be used with Handicare C-300 or C-450 lift units. 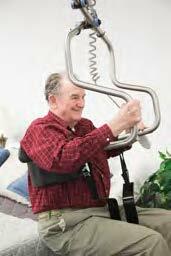 The Independent Lifter was designed to provide independence and freedom to various transfer situations. In combination with a Prism Medical ceiling lift, the Independent Lifter removes the need for a sling, and gives simplicity and accessibility for convenient application for situations including swimming pools, toilets, showers, and others. The Independent Lifter is perfect for homecare where simplicity, independence, and safety are needed.